Welcome to our 9th episode in our new podcast series that’s all about making big profits through tax-delinquent real estate investing – in houses and land. This REI niche is actually one of the most profitable ways to invest and can provide the biggest margins. In fact, we were able to go from $0 to $1 million in profits and equity in 18 months through tax-delinquent REI. We’ve done more than 3,000 deals and want to share all we know about tax sales with you! In today’s episode, we’re talking about the types of letters that we send out when we are looking to invest in land or houses. We’ll cover the different kinds of letters and their uses, when and how to use them and, also very importantly, when NOT to use them. We’ll also touch on how many letters to send, what response rates you should expect, the number of offers you should make and much, much more. Intro: Are you ready to transform your financial future? Here’s your chance to see inside the mindset of self-made millionaires, Jack and Michelle Bosch as they pull back the curtain on secrets that can make you rich. Discover how everyday people are breaking the norms and building empires from the ground up using little known yet proven, and time-tested, wealth building real estate strategies. 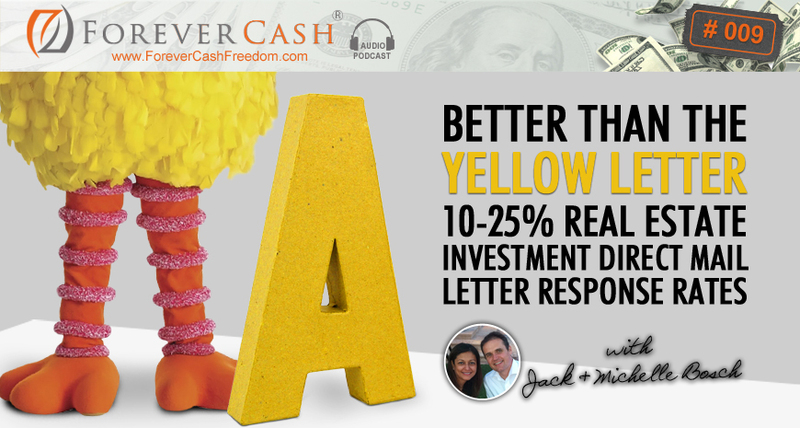 It’s my pleasure to welcome you to the ForeverCash.com podcast and introduce you to our hosts, serial entrepreneurs, investors, educators, and best-selling authors, Jack and Michelle Bosch. Strap yourself in for the ride of your life. Jack: 2004, you’re correct. We started in 2002 so that would make sense. In 2004, we were officially worth $1 million. And obviously it has grown since then. So Michelle, what are we going to talk about today? Michelle: Well, what I would love to talk today is the types of letters that we sent out when we either want to invest for land or we want to invest in houses. Michelle: And as everyone knows, we are basically talking about tax-delinquent real estate. And you can use our techniques to either wholesale or buy land, or buy and wholesale homes, either way. Jack: Or find tremendous bargains and houses that you can keep. Michelle: Yeah, absolutely for buying whole. Jack: For buying whole and rental properties. So before we get started though, I want to make you aware again that we have a special gift for you. And that gift can be found on the website www.forevercashfreedom.com. It’s a free course that shows you the fundamentals of real estate investing. The way we do this is one of the most profitable ways that I have seen around. And actually, this has been confirmed just recently when we did a live event. In the front row, there were two people sitting, professional real estate flippers. And they basically said that ever since they’ve been doing our methods, they got the biggest margins on the deals that they have had ever. So, go to forevercashfreedom.com and go access your free mini course on how to deal with tax-delinquent real estate houses and land. Michelle: Yep. Okay, so should we get to the beginning? Jack: Send out your letters, right? Jack: Let me just throw in a number. And when you send out the letter in direct mail of real estate, usually what people get, if they’re lucky, if they have a good day, they get one, two, if they’re really good they get 3%. Yes! You hear about this magic yellow letter. But by now, the yellow letter has been used by everyone and their brother. So, even the yellow letter doesn’t get these response rates that it used to get anymore and so on. But, most people using direct mail in real estate, whether you use handwritten postcards or they use mass-produced materials whichever it is, they get anywhere from 1 to 2% off of that. Now, I want to throw out a number. And that number that we tell our students particularly if they’re flipping land is that if they get a less than 10% response rate, they need to contact their office because they’re doing something wrong. So basically, what we’re about to tell you right now is that you can get a response rate of 10% and up to 20, 25% from people. That means that if you send out a 100 direct mail letters, you get 10 all the way to 20 or 25 people to call you back with being interested selling you their property. Michelle: Which letter do you want to talk about first, the neutral or the delinquent letter? Jack: Well let’s talk first about the delinquent letter. Jack: Right. So, should I take it from here? Michelle: Well, yeah. Tell us the pros and cons of that letter and what situations would you use that letter. Jack: Okay, sounds good. I’ll do it. So, here is the thing, you guys, Michelle said it and if you looked at some of our other podcast episodes, we talk about tax-delinquent real estate. Tax-delinquent properties are our bread-and-butter. And there are millions of them all around the United States. Last time I checked, there were over 2.3 million properties in the United State where the owners have not paid their property taxes. Michelle: Depending on the area though, there’s a percentage also of property owners where it was just an oversight and they forgot to pay their property taxes. Michelle: You’ll have that in the mix. Jack: Oh, yeah. There are also of course people that also depend on when you get the list of delinquent property owners. Jack: If you get that list 8 months after the taxes were due, then most people who have just forgotten to pay their property taxes by now have remembered and they have sent their property taxes in. If you get that list two weeks after taxes were due, then it’s full of people that just forget to pay their property taxes. So, that plays into that a little bit. But let’s assume you get a list of… When I say a list, it’s like you contact the county and you ask them for the list of all the properties that are tax-delinquent and they send that to you. You pay a little fee for that, $50 bucks, $100 bucks, sometimes between $50 and $300 bucks is pretty much the average for that. And, it has thousands of records on there of people that haven’t paid their property taxes. Now, when you get that list and if you turn around very, very quickly… And, only under those conditions you can send a letter that actually tells people that they’re delinquent for nonpayment of property taxes. Here is the thing, because of what Michelle just said that if your list is not fresh anymore, if your list is like… If you get that list and let that list sit for 3 months in your bookshelf and then you start processing it and sending out some letters, there are a whole lot of people who in the meantime have basically paid their property taxes. If you sent them a letter that basically says, “Hey, I’m contacting you because you owe property taxes and if you don’t pay your property taxes, the government is going to take your property away, sell it to the auction or somebody will foreclose on it. So you don’t want that to happen. Call us, because otherwise you’re about to lose your property.” The people who just paid the property taxes in the last few months since you got that list will completely freak out. And if they completely freak out, what they’re going to do? They’re going to call two people. They’re going to call you and they’re going to go ballistic on you. And, they going to call the county and go ballistic on the county because what they think is that the county didn’t receive their check, didn’t enter their check, and that your information is wrong. And in fact, at that point, your information is wrong because they already paid the taxes off. Therefore, we use two different letters. And, we only use the tax-delinquent letter when you have a list of delinquent property owners that haven’t paid their property taxes and if that list is fresh. And with fresh, I mean, less than two weeks old when you send out those letters. Because yes, you can get the 30% response rate to your letter by sending it to people that have paid their property taxes and telling them that they owe property taxes, but you’re going to get 30% of upset people calling you and that’s not the goal. Michelle: So, there’s an element where the letter is a little bit more aggressive. Jack: …What we call the neutral letter. And, the neutral letter is basically a very similar letter. It’s just is a very well, in other words, neutral letter. Jack: Really, yes. And, there are some key sentences in there. Like for example, that you pay cash, that you pay a good price or fair price and that we have satisfied customers and a couple of other words. With our letters, we have tested them with over 3,000 of our deals. We’ve done lots of tests to come out with that letter as being the best performing letter and it has those aspects in there. So, it addresses them directly. It addresses them in the… It basically tells them where the property is located or which county. We tell them. Perhaps then, you can put it the parcel number, but if they have multiple parcels, you don’t need to put in the parcel number. You can leave it out. And then, it tells them that you are interested in buying their property and that you are interested in paying cash and that you are going to pay them a fair or good price. And then, you tell them to contact you and that you are available for the phone calls and that you have satisfied customers. Michelle: That you have satisfied customers. Jack: If you put those eight to nine elements into the letter, it will perform very well. And then, people are going to call you because they don’t feel threatened. They don’t necessarily… What we actually do is we leave out the extra parcel number. We don’t tell them what property we are calling. We are sending them a letter because we want them to call out of curiosity because often these people that have multiple houses or multiple pieces of land, they don’t know which one we are calling about. And either it comes then… All of it comes out that this one is a particularly good one and which one is a particularly bad one. That was good information too because you can stay away from it or you can adjust your offer price or it’s just got to be something like that this is the one that is too far or the furthest away and that it’s the house that he has to drive furthest to actually handle so he wants to sell that one first. And then, it’s a neutral reason and it makes sense, but it also builds you. It gives you the opportunity to build rapport and see what… “If you perhaps want to sell all of them” because sometimes they think you are calling about one property particularly. If they have properties in other counties too, they’ll call you and they’ll say like, “Well, I have three properties in this county, but I have five in another county. Would you be interested in those too?” And you say, “Absolutely!” If that’s an area you also operate in, then that opens the door to buying more than one property from the same person. Michelle: Or, this is the opportunity to find an amazing other area that you were not even aware of. Michelle: And you can do some research. And, if you can see that properties are selling very, very well on that other county, even though you might not operate in that county, it can just open the door to you just having found an amazing county to do business in. Michelle: You can even get a topo. Jack: You can even get a topo or topographical maps free online. You can see exactly how the land rolls, if it has steep hills or if it’s flat. You can see if it has electricity on it. You can find anything about a piece of land out of almost everything without actually going to the piece of land. So, if somebody calls you and has a few pieces of land and some of them are even across the United States in a totally different state, it has enabled us often or quite frequently actually to flip pieces of land all the way to across the state. This is the number one way that we have been able to expand from one area where we have been buying properties and flipping properties. For example, we were doing deals in Arizona where we live, and then somebody gave us a portfolio of 20 properties for $3,000, 21 pieces of land for $3,000 and one of them was in Hawaii. Actually, two of them were in Hawaii, three of them were in Florida, one of them was in Indiana, one of them was in Oregon, one of them was in Montana, a couple of them were in Texas and a few were in Arizona and California and also a few places. And, based on a deal on its own, we started being able to grow from one area where we were doing deals and expanding into five areas. We went to the same area in Florida and flipped the total of another 300 properties there. We went back to Hawaii and flipped a few more properties there. We went to Texas and flipped some more properties there. And why? Because after taking them all for a token payment of $3,000, we realized that we were able to sell some of them very, very quickly at tremendous profits. And, when you find that one, it won’t make sense to go right back to the same areas and then buy some more properties there. And, by the way, you can do that with houses too. It’s just a little bit more involved because of the estimation of repairs and so on and so forth. But, you can even do that. Now, there is one of our programs with the Flip It Fast Formula which is… You can find out more about it under www.FlipitFastFormula.com and it’s also going to be in show notes of this podcast. By the way, you can always find the show notes under www.ForeverCash.com/podcast. Michelle: And so, the neutral letter is a letter that you can use mainly off for land. The delinquent letter is a letter that you can use for both land and for homes. The delinquent letter though, when you are using it for both land and homes, like Jack explained, the list needs to be fresh, it cannot be more that two to three weeks old. Otherwise, you are working with outdated information and that may cause some stirrup at the county with property owners calling because they are freaking out because you are sending them a letter saying that they haven’t paid their taxes when some of them may in fact have already paid their taxes. So basically, the delinquent letter can be used for both land and homes when the list is fresh and the neutral letter preferably for land. And, why is the delinquent letter the only letter for houses? Because usually with houses, there is a little bit more competition. So, there is a more of time urgency there and I don’t know if you want to explain. Jack: There is more of a… Yeah, it can jump in for a couple of things here. There is time urgency to it and also the house owners need to be pushed a little harder to call in order to pick up that phone. So, you want to be a little bit more aggressive with house owners and tell them, “Hey! If you don’t call me, you will have a good chance of losing that house to tax foreclosure.” And, that stirs them a little bit so they pick up the phone and call you. On land, that’s actually not even necessary because a lot of land owners have been sitting on that land for 20 years. All they need is one letter telling them that you are interested in buying the piece of land. And, they call you automatically because they haven’t received any other letters because everyone in the business is going after houses which leaves that land market to all of us available. As a result, with the neutral letter used for land and also with the land letter, you get a 10% to 20% response rate consistently. And, with the tax delinquent letter on land, you get an even higher response rate. In a tax delinquent letter on houses, your response rate is obviously substantially lower in the house rate because there is more completion, but at the same time, you still often see a 3% to 5% response rate particularly if you take that letter and create two different variations of it and write multiple letters. Jack: Multiple campaigns or mailing campaigns to the same home owner. This is something that you don’t necessarily need to do in the land area. But, on the houses, it does make sense to send them the first tax delinquent letter, then a variation of it in a postcard perhaps 10 days later or 10 to 14 days later, and then another variation of it for another two weeks later. And, you can actually keep that. If you keep them at a weekly tax between one and two weeks between each mailing campaign, you can actually continue writing them as tax delinquent letters because if you get the list today, then you send out your letter next week. By the time they get the third letter, it’s only been three to four weeks before they get the third letter. So, it’s still within that fresh time period or time frame that they will be notified. And therefore, mentioning to them that they are delinquent and being a little bit more aggressive in those four months actually totally makes sense. And then, combined over the three letters, you also get to a 5%, 6% or 7% response rate on a regular basis. Michelle: Yeah! Another thing that I wanted to mention is that this delinquent letter is really, really effective when you want to basically invest in homes that are located in tax deed states. And, the reason for that is because in a tax deed state, this home that is tax delinquent, if it’s over a certain period of years, depending on the state, a lien is not the one that is being auctioned off but it’s the actual property. So, there is a much higher sense of urgency from the point of view of the seller. Jack: Because there is a set date. Michelle: When they are about to lose the property. However, it does… I don’t want to oppose Michelle here, but I want to add something to what you said. And, that is that we can also accomplish that exact same kind of picture. And, I know what you are saying in the tax deed world, where they’re actually selling the property at a certain date, if you know that date, you can put it in there and it becomes even more urgent. But, in tax lien states where the process works such that the lien is being issued and the lien is being sold at an auction, and then after a certain amount of years, the lien holder can actually foreclose on the property, what you can do is you can select from the list of properties that you have from the list that you got from the county of tax delinquent properties. You can select to mail only those who are already passed that deadline. So, you can select to mail only the people that are already three years or four years delinquent depending on what that cut-off or deadline is. That allows a lien holder to foreclose. Then, you can make a similar case and you can say, “Hey! Dear Mrs. Seller, you owe taxes on this property for more than three years already. Are you aware that the lienholder on that property can actually foreclose any moment? Jack: It will be a subset of the list that you get from your county, but there are ways to actually do this too. Michelle: So now, a person has picked an area. They have their list. They have written their letter out. Or, they’re ready to do their mail merge. Now, how many letters should they send when they’re initially targeting a county and they want to test such a county? Jack: All right. So now, you’re going to the nitty-gritty here. Michelle: Well basically, what I would like for somebody to know is to model it into the future. Okay, if I was to send X amount of letters, what response rates will I have in terms of calls received? How many offers should I be making? And, how much do I expect in terms of acceptances? Jack: All right. I mean, you know what? That’s a perfect question. That’s a wonderful weigh in. By the way, what you just listened from Michelle, this is exactly how you should be thinking and how everyone should be thinking about their business. If you truly want to make this a business, you don’t want to just go on sheer luck. You want to know your numbers. You want to know what numbers because when you can’t forecast your numbers, you won’t know how many letters it’s going to take to send and how many offers you need to make. How many phone calls do you expect to receive? How many offers you expect to make? And, how many deals do you except to do out of that one and what’s your profit per deal is? All of that. Now, you can actually build this and scale this to a business. What we want to do here is we want to teach you how to build a business, not how to become a treasure hunter. So, thank you very much Michelle for being so organized on that because that’s what she is. She’s the organized one. Jack: In our company one, I’m more like the crazy one here. The number of letters or postcards that you need to send out… Obviously, cards work too. Postcards will get you low response rates but they also cost less. So, what our experience is that the actual amount of money spent per deal is almost the same between postcards and letters. In letters, you get a higher open rate, but the cost per letter is a little bit more than it is on the postcard. Therefore, I’m going to talk letters right now and you can translate that to postcards because we love sending letters. That subject is going to be the subject of another podcast episode in one of these days, but it’s whether to send letters or postcards and what’s supposed to be in there. But yeah, we love letters because people open them more than postcards. It looks more professional. It looks more serious and so on. There’s no way to make a postcard to really look like it’s hand written. There are a few ways, but it doesn’t really look good. And, there’s no other way to make a postcard look like it’s not bulk mail. Everyone knows that when they get a postcard, it’s bulk mail. Having said that, how many letters you need to send out to get a deal depends on the following factors. It depends on what price point of property you go after. And, it depends on whether it’s delinquent or non-delinquent. So, if we take land… Also, it depends on whether its houses or land. Let’s segment that out. If you go after land and if you go after the price segment of the lower end pieces of land worth between $5,000 to $80,000, then you can kind of expect to get a deal anywhere between every 200 to 500 letters that you send out. The lower end of price scale you go, the less letters you need to send out. Basically, there are areas in the United States where $3,000 properties exist as a dime a dozen. There are like hundreds and even thousands of them that are out there and you can get a deal for every 100 letters that you send out. As a matter of fact, the most we’ve ever gotten was not normal. We send out 100 letters and we got 55 phone calls. Yes, 55 phone calls! And, we bought 35 properties off of those 100 letters. Now, that’s an anomaly and not normal, but many times, we have these kind of deals. But, these were all $4,000 properties. We bought them for $400 and sold then for $4,000 with seller financing. We’re asking for $400 down payment and $100 dollars a month for five years. Great deals! We bought 35 of them for $400 each. How much is that? That is 35 times $400, so that’s about $14,000 that we paid for these 35 properties. And, we sold them for actually about $150,000 altogether and getting about a $14,000 down payment. So, all of our money was back and the rest was on pure profit cash flow of $3,500 a month. We love it! But as I said, there was an anomaly. But, it shows the point here that if you’re going after the lower-end properties in the land area, you might send out 200 letters and you might get two or three deals for that. You might send out 500 letters and you might get three, four, five deals for that. If you go after $80,000 properties, you might have to send 700 to 800 letters to get a deal. But therefore, on that deal, you’re making $20,000, 30,000 or more and perhaps even $40,000 on that deal versus all those little deals when we only make $3,500 per deal. Jack: …Than it takes you to get an owner of an $80,000 house to call you. But, there’s also many more $80,000 houses where the owners don’t pay the property taxes and let the property go for a tax foreclosure than there are $1 million homes because the $1 million home owners are usually well aware of that. They usually have the tools. They have the relationships and they’re quicker on their feet to do things. And a lot of the times, the people that have $80,000 houses, they just don’t know they did. They just moved away. They are just in a totally different place in life where the reason why they live in an $80,000 home or the reason why they have a torn or trashed home is that they don’t care about money as much as the people in the $1 million homes. They don’t know how to handle money and that’s why they don’t have any. That’s why they’re in financial trouble and that’s why they need to sell those properties in the first place. It’s sad but that’s unfortunately how it off nixed. Michelle: It’s usually… You’re basically helping good people with bad reality problems. That’s how I like to see it. Jack: Exactly right! These are good people and whether you like it or not, they’re going to lose their property at tax sale or to a tax lien foreclosure. So the choice is, do you step in and give them money in their pockets? Or, do you not step in because you feel bad for them and therefore they lose at everything? I think we’re doing them a service. And for example, can I quickly tell an example of the deal that we did last year? Jack: There was a lady that we send out our letters. We sent the first iteration of house letters, then the second iteration. And after the second iteration, we got a lady to call us from California. She owned a house with an after repair value of about $160,000. It needed about $25,000 in repairs and we arranged to buy the property from her for $85,000 which was kind of the upper hand of what we should have offered. Perhaps, we should have gotten it a little cheaper, but we agreed to $85,000. After she had some back taxes and some little loan on it and things like that, she netted $68,000 on that property. Now, the property was four years tax delinquent. A lien holder had already bought the lien. The lien holder had already started the foreclosure and the lien holder was only about two months away from the foreclosure. It was a probate case and her husband had passed away and so on. So, what we did we is we got her to probate. We closed on the property and we flipped the property. We made $9,000 in the property in the process by basically selling this property for $94,000, and then to a rehabber who then rehabbed it made it the prettiest house on the block. Jack: It’s absolutely gorgeous and the lady made $68,000 in the process. Now, what if we would not have stepped into this scenario? The person that had the lien was way down his path for foreclosure. He would have foreclosed two months later on this property. When he was foreclosed, he would have gotten this property free and clear, the entire mortgage would have been wiped out and the property issue would have been taken care off because it would have been for foreclosure or tax foreclosure. And literally, they would have… This investor would have gotten a $150,000 house. Let’s say, the net worth right now is perhaps $120. A $120,000 house for just four years of back taxes which ended up to about $9000 plus the attorney cost for $12,000. While that would have been great for this investor, the lady would have gotten absolutely nothing but zero zip for that property. She would have gotten nothing. So, who ended up helping this property? Who ended up helping the lady? It was us by stepping in and putting cash in your pocket. So, when you do these techniques in tax delinquent properties, you are actually the white knight coming in or the night in the shining armor coming in and helping these people putting cash in their pocket and helping them to walk away from the property that otherwise they would have gotten absolutely nothing. Michelle: Wonderful! Great. So now, tell me about offers. So, let’s say they mail out 300 letters and they get 100. How many calls did they actually get? I say 150 calls. Jack: All these numbers are a little different based on what price range you range if you go after a normal city, a bigger city or outside of like these extra expensive cities like L.A., San Francisco and so on. But, if you’re just in a normal American city where most houses costs, where the average house costs between, let’s say $150,000 to $200,000, then if you are under $150 to $200,000, you can kind of count with getting a deal using this method for about $800 to $1400 or $1800 to $1500 in marketing costs. That means between… You can take 500 people that owe property taxes, send them the three letter sequence and now spend about $1400 and you should have a deal out of those 500 letters that you send three times in a row. And obviously, if you scale this much more, you get more deals. One of our students just sent out 2500 letters and sure enough, he has gotten five deals from that and made over $100,000 on those deals. Michelle: Now, let me jump in. So, with what Jack just mentioned right now when he has a student that mailed out 2500 letters… If you are a beginning investor, you need to think about that number of letters that you are mailing out from the point of view of how you are going to prepare to service all of the inbound calls. Because when you send out mailing that large and if you are not basically sending that in chunks but you send that all at once, believe me, your phone will ring off the hook. And, while you’re talking to someone, another person will call and while you are listening to that voicemail, you will miss another call. So, you need to be prepared to service those inbound calls. So sometimes, the number of letters that you mail out weekly actually depends on how much time and your capacity to service the inbound call. Jack: Very good point. Because otherwise, you get overwhelmed by phone calls particularly if you do this in the land area. Jack: Great! So now, let me answer your question, probably you think you were going to the question of like, “How many offers do I make to get a deal?” Well, here is a very simple rule. It’s a very quick answer. Leave no leap behind. That’s basically our motto on it. Every person that calls you needs to get an offer. Michelle: Even the people that where you play phone tag and they call you and you were on another line and you called them back and then they call you. If you are able to identify what property this person was calling for, even if you never connect with them, they need to get an offer from you. Jack: Even if they ask you, “I want full market price for the property and they are offering me less,” offer! Make your offer. Ignore what they said. Offer it because you never know if they were just bluffing. We have had more than one example and plenty of examples where somebody wanted $25,000 for the property and we offered them $5 or $7 for piece of land and they accepted it. When somebody wanted $5000 for a property and it’s only worth $5000, so why would we want to make an offer? So, we offered them $500 and he accepted it. There were offers where somebody wanted $150,000 for a house, we offered $100,000 and they accepted. You never know if they are bluffing. Leave no lead behind. And then, as a result, as I mentioned, if you are sending out a 1000 letters and you’re getting 100 phone calls, you’re making 100 offers. Chances are, depending on or based on those ranges that they talked to you about, it’s very high likely that there is a deal in those set of offers. Michelle: And, something else that I would like to add which is… So, you received the calls back and now you are excited. The phone is ringing and what do you say to your seller, to your potential seller? Well, you have to have a script where you have basically outlined the information that you want to get from this person about this particular property. And, we’ve actually… This, I think, will be a topic of discussion in another podcast. But, you definitely want to have a script and it helps you now if you are taking the calls yourself. But, it will help you a lot to have such a script when you decide to basically outsource this and you are ready to scale your business basically. When you no longer will be taking the calls, but somebody else will be helping you, it will be very helpful to have a script so that they can capture the information that you need in order to present these people with an offer. Now, like I said, that will depend on where you are at. If you’re ready to outsource, this will help you. If you’re right now doing it yourself, it will help you as well. So, that’s basically what I wanted to add. Jack: What county? What utilities does it have? Does it have a mortgage on it? And, so on. In the house area, you want to ask about repairs. You want to ask about how many bedrooms or bathrooms? How many square feet? How old is it? What year was it built? Those kinds of fundamentals. So, if you think through them, you’ll come up with a list. Obviously, we have detailed lists in our programs and so on which you can find, as I mentioned before, at FlipItFastFormula.com or for the land at LandProfitGenerator.com. Either way, there are details on there and we’ll include a couple of things also in the podcast notes here to help you along with that. So, with that I want to… I think we are running out of time. So, that was a good subject. I liked that. Sending out these letters is really the most powerful thing you can do. It’s easy. It’s inexpensive. And, it’s very, very powerful because it makes the phone ring. And, you want the phone to ring because without the phone ringing, there is no deal. So, no deal means no money. Thank you very much! Again, I want to thank you. Again, we have the meeting notes on Forevercash.com/Podcasts. Don’t forget to get the free mini course on the fundamentals of tax delinquent real estate investing and the way Michelle and I do this. We have been doing this since the end of 2002. We have flipped over 3000 going to 3500 houses and pieces of land. We have done this all over the country from Hawaii to Florida and you can get this free mini course at ForeverCashFreedom.com. Last thing I wanted to mention is I would love for you to go and tell your friends about this podcast. And also, I would love for you to, number one, make sure you subscribe to it. Press the subscribe button either on your iPhone or on iTunes on your computer. And also, leave us a review. You can do that right there on iTunes or right there on your phone. There is a place right there with this podcast episode to leave a review and obviously we would love for it to be a good positive review. Every review counts. It helps us spread the word and it helps us be able to reach more people with this message that I call the Real Estate Investing Made Easy. Because when you buy pieces of land for $0.05 to $0.25 on the dollar or when you buy houses that the owners don’t literally want anymore… I got a deal right in front of my table where the owner, where we are offering or we are paying $1500 for this property, $1500 for a house plus back taxes of course. If you buy houses for these prices, then you don’t need to talk to a bank. You don’t need to qualify for a loan. There is no red tape and you don’t have most of the complexities where traditional real estate falls away. And, that’s a very, very cool thing! So with that, I say thank you. My name is Jack. Michelle: And Michelle. Thank you! Jack: And, thank you very much! See you in the next podcast. Outro: Thanks for listening to the Forever Cash Freedom Podcast. Subscribe now for future content-packed episodes on how to push the ejector seat on your financial hamster wheel, and discover our radical way to freedom and wealth through cutting-edge real estate investing strategies. To learn more about living the “Forever Cash” lifestyle, investing smartly and becoming financially free, visit www.ForeverCashFreedom.com to claim your free “Forever Cash” Starter Kit today!